Nick Mason worked with Carla Bley and Michael Mantler on a number of projects in the 1970s and 80s. The connections between the three are quite convoluted, even to those who follow their music. When you expand the scope to include related musicians that Mason has worked with (such as Gary Windo and Steve Swallow), the number of albums really gets quite large quite quickly. For the sake of simplicity, I'll call this an introduction to WATT music. WATT was the record label started by Carla Bley and Michael Mantler in 1973 to allow them to record and release their music without the constraints imposed by the music industry establishment. But WATT has been restricted to the music of Bley or Mantler. When their 'family' of musicians (such as bassist Steve Swallow, or Bley and Mantler's daughter Karen Mantler) began wanting to release their own music, they created another label called XtraWATT for these 'extra' projects. And though saxophonist Gary Windo worked extensively with Bley and Mantler (and Mason) in the late 1970s, his own solo projects have been released on other labels. All told, there have been some 33 WATT releases, and another 11 on the XtraWATT label. I haven't heard them all, and I wouldn't think of reviewing all of them here, even if I had. Without a doubt, many of them will have no particular appeal to the average Floyd fan. But a number of them will definitely appeal to some Floyd fans, for various reasons. The obvious place to start isn't a WATT release at all, but rather the album that is already familiar--at least in name--to most serious Floyd fans: Nick Mason's Fictitious Sports. Recorded by members of the Carla Bley Band in 1979 and released as a Nick Mason solo album on the Columbia label in 1981, Fictitious Sports is often reviled as being too goofy, too strange, and too unFloydian for most fans. As an introduction to Bley's music, it isn't even typical of her style or arrangement, but some typical Bley elements are there: the oddball sense of humor, the blistering solos, and fusion of jazz styles with rock and avant garde rhythms and structures. If you don't approach it expecting something along the lines of Dark Side or The Wall (or even Amused to Death or About Face), you might be pleasantly surprised. By my count, there are five other WATT (and related) albums that have direct Mason connections. The first I ever heard was Michael Mantler's Live, a sampling of the performance Mantler gave on February 8, 1987 at the First International Art Rock Festival in Frankfurt, Germany. The band includes Mantler on trumpet, Mason on drums, and several others. The music is somewhat dark and cerebral, and isn't particularly Floydian, but it serves as a nice sampler of Mantler's work, with selections from No Answer, The Hapless Child, Silence, and Many Have No Speech (which had not yet been released). Personally, I bought it because besides Mason the band included guitarist Rick Fenn (who had worked with Mason on Profiles and several film scores) and Jack Bruce, the legendary singer and bassist from Cream. Two releases by Gary Windo--His Master's Bones and Anglo American--are worth finding. Both are posthumously-released retrospectives of Windo's career, and both contain tracks from Windo's Steam Radio Tapes project, recorded at Britannia Row Studios between 1976 and 1978 with Nick Mason as drummer and producer, but never released as an album. Also included are appearances by Robert Wyatt and Hugh Hopper, as well as recordings Windo made with D. Sharpe and Steve Swallow (both of whom appear on Fictitious Sports as members of Carla Bley's band) for yet another unreleased album. Windo's duets with Carla Bley (found on His Master's Bones) are particularly beautiful and not to be missed. Finally, two more Michael Mantler releases have direct Nick Mason connections, but are less likely to appeal to most Floyd fans. The Hapless Child is a collection of dark (and occasionally humorous) poems by Edward Gorey set to somber music by Mantler. Mason did some post-production mixing work at Britannia Row, and this was his first work with Mantler and Bley. There is little here that resembles the Floyd, or even Fictitious Sports. The music is nice, and the lyrics do tell often-compelling stories, but if you are buying this album because of Mason's involvement, you might try out the 1987 live album first, so you know what you are getting yourself into. If you enjoy Live and The Hapless Child, then you might also enjoy Something There. Mason played drums throughout, and Swallow and Bley are in the group as well. The music is typical of Mantler's style: trumpet melody over prog-styled backgrounds with minimalist overtones. It has its moments, but it may be far too monotonous and meandering for the average Floyd fan. Unlike The Hapless Child, there are no lyrics to sustain your attention when the music can't. In the grand scheme of things, Nick Mason is really little more than a footnote in the history of WATT music. There are 30-plus years of great music to choose from, so let's look at some of the highlights. The album that will have the most appeal to fans of Fictitious Sports is almost certainly Carla Bley's I Hate to Sing. The same vein of quirky humor runs through both albums, perhaps even more strongly on I Hate to Sing, though the music tends more toward jazz than the rock feel on Fictitious Sports. The opening song, "The Internationale", features an infectious groove with every member of the band chiming in for a line or two of clever lyrics and jokes (not unlike "Can't Get My Motor to Start", from Fictitious Sports). "Murder" is a little crime melodrama, and "Very, Very Simple" and the title track are quasi-comedy numbers. The album is half live performance and half studio recording, and you really get a feeling of how much fun Bley and her band had interacting with an audience. The studio side of I Hate to Sing continues the same cleverness. Anyone who has ever suffered through piano lessons (or better yet, suffered through someone else's piano lessons) will immediately get the joke of practicing scales on "The Piano Lesson", which also re-uses the riff from "Can't Get My Motor to Start". "The Lone Arranger" has a few musical jokes thrown in also, but is more notable for the stunning blues by trombonist Gary Valente, and some fantastic arrangement by Bley, in which every member of the group gets a chance to shine. All in all, I Hate to Sing is a fun album that really deserves to be heard. The CD-ROM featurettes on Karen Mantler's Pet Project briefly explain the album's premise. Another stand-out album in the WATT family is Karen Mantler's Pet Project. Karen Mantler is the daughter of Michael Mantler and Carla Bley, and she grew up touring with the Bley band and struggling to find her own musical voice at places like the Berklee College of Music. Her first album, 1989's My Cat Arnold, shows off the influences both parents had on her songwriting style. She uses traditional jazz influences as well as avant garde rock in love songs about her cat, her mother, her stove, and so on. In 1990, she released Karen Mantler and Her Cat Arnold Get the Flu, and after Arnold died, she performed a requiem called "Arnold's Dead" at the Montreal Jazz Festival in July 1991. Gary Valente, Steven Bernstein, and Pablo Calogero lay down horn tracks for Karen Mantler's Pet Project at Grog Kill Studio. But Arnold's influence on Karen's career continued, and in 2000 she released Pet Project, featuring Bley band alumni Arturo O'Farrill, Hiram Bullock, and Gary Valente (who Karen has since married). The album is full of humorous touches as Karen begins her search for a new pet, and debating the relative merits of various species. "Wild or Tame?" is one particular standout, a fiery Latin tune interspersed with enthusiastic advice from the band ("How about a turtle? Turtles are nice; they don't bother you." "I hear Sea Monkeys are very hygienic.") Karen's songwriting and arranging are strongly reminiscent of Bley's style, and Steve Swallow is an able producer. The result is a highly entertaining concept record. Don't miss the video clips of Mantler and her band recording the album, included as a CD-ROM feature. 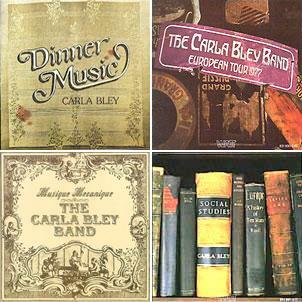 Several other Carla Bley albums stand out as particularly good in their own ways, and four come from roughly the same period as Fictitious Sports. The tunes on Dinner Music (1977) range from traditional jazz to funky fusion to light jazz that borders on elevator music. The album titled European Tour 1977 is actually a studio recording, but it features the same personnel as Bley's band from that tour, including Hugh Hopper and Elton Dean from Soft Machine, as well Gary Windo's debut with the Bley band. A particularly notable track is the epic "Spangled Banner Minor and Other Patriotic Songs", which incorporates themes from songs like "The Star Spangled Banner", "La Marseillaise", "Deutschland Ueber Alles", and "Stars and Stripes Forever". Musique Mechanique (1979) includes Latin jazz, electronica, and snatches of wild, avant garde music reminiscent of Gary Windo's work with the Brotherhood of Breath. The multi-part title track is a concept piece using music boxes and clockwork alongside the band to create 'mechanical music', complete with sections that sound all the world like a skipping record. 1981's Social Studies also shows off Bley's wide range of musical influences and interests, with a 13-minute tango on which Gary Valente really shines, and the lovely, Duke Ellingtonesque "Copyright Royalties", which features both Valente and the clarinet of Tony Dagradi. The mid-1970s through the early 80s may have been something of a 'golden age' for the Bley band, but she continues to write and record interesting music. If, instead of the offbeat humor of Fictitious Sports or the avant garde, you prefer your jazz to be a little more traditional, 1991's The Very Big Carla Bley Band might be a suitable starting place. The album is quite accessible, and covers a variety of different jazz styles. "United States" is mainly a traditional big band tune, a la Ellington or Count Basie, but with some modern touches. "Strange Arrangement" pays homage the hard bop ballads of Miles Davis or John Coltrane, and around the 5-minute mark is a piano solo strongly reminiscent of Thelonius Monk's heavy-handed style. "Who Will Rescue You?" 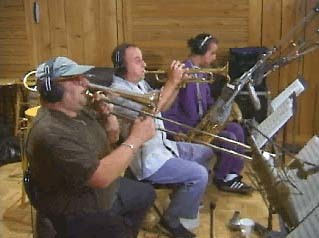 is a gospel boogie tune with another killer trombone solo by Gary Valente, whose piercing tone colors so many Bley recordings. And "Lo Ultimo" ventures into Afro-Cuban jazz territory, with Andy Sheppard's soprano sax taking center stage. I would recommend without reservation any of the above albums to the Floyd fan looking to sample what Bley and WATT have to offer. But we haven't really scratched the surface of what is out there. What follows are some suggestions for those who have enjoyed the above and want to dig a little deeper into the WATT catalog. I don't know exactly how to characterize Escalator Over the Hill. Written by Carla Bley and lyricist Paul Haines, and recorded by the Jazz Composer's Orchestra of America (an outfit organized by Bley, Mantler, and a number of other free jazz notables who went on to populate Bley's big band in its earliest incarnations) prior to the formation of the WATT label, Escalator is a monster three-LP concept piece that is often referred to as a 'jazz opera'. Bley and Haines themselves referred to it as a 'chronotransduction', whatever that means. There's a script included, and the list of performers is so vast and varied that it takes up both sides of the gatefold inner sleeve. I'm sure there's a story of some kind buried in all of it, but frankly I don't have the energy to sort it out. Although a lot of the album is musically average, there are a number of great moments. Much of side 3 will really appeal to prog rock fans, as will "Rawalpindi Blues" on side 5, featuring the voice and bass of Jack Bruce (who performs throughout the album) and the guitar of John McLaughlin. The first WATT release, Tropic Appetites, was recorded not long after Escalator and shares some of the same conceptual aspirations, though it is much shorter and more focused. The album is definitely weird, with music ranging from the deliberately goofy to the transcendently beautiful. There are prog rock touches too, with raucous cacophony giving way to mesmerizing polyrhythms. It may not be Bley's best album, but it certainly has its charms. The Carla Bley Big Band Goes to Church was also intended to be a concept album of sorts--a collection of church music arranged in her own style. But when she didn't have enough such music to use, she wound up composing her own reverent, religion-inspired pieces. The results are beautiful, moving, and dramatic, and while it may not be a top-shelf Bley release, it comes close. Goes to Church is a live concert recording, but the somber material means there is little lighthearted interplay between audience and performers. Similar criticism could be aimed at 1982's Live!, which features a very tight band and arrangements, but seems a little lackluster in some intangible way. The DVD release Carla Bley Live in Montreal balances the serious and the humor more effectively, with a selection of music spanning Bley's career (and showing her international appeal when, during "The Lone Arranger", she delivers her jokey lines in French). For a very different type of Carla Bley music, you might try Heavy Heart, which is by far the best of several 'light jazz' albums she did in the mid-1980s (including Night-Glo, Sextet, and Steve Swallow's Carla), all featuring Bley, Swallow on bass, guitarist Hiram Bullock, Victor Lewis on drums, and a few assorted other players. Most of these are lightweight and fairly forgettable compared to Bley's wilder big band arrangements. Heavy Heart is the exception: it is quite listenable, even for those of us who aren't fans of modern/light jazz. Those who are fans of this sort of thing should like it quite a lot. Two of Michael Mantler's albums, Movies (1978) and More Movies (1980), might also be of interest, and have recently been released together on a single CD. Rather than Mantler's usual abstract minimalism, the music is jazzy rock with some prog and funk touches sprinkled throughout, often suggesting what Yes or Gabriel-era Genesis might have sounded like with a horn section. I haven't really scratched the surface of WATT, and I've ignored much of the most recent material and most of Michael Mantler's output. That isn't to say that these aren't good records--I've just tried to pick some that would be most appealing to fans of the Floyd. Bley fans should be sure to check out the WATT website. Not only is the interface clever and fun, but there is a lot of information tucked away here and there. (Beware: some of the 'facts' are actually elaborate jokes, and some of the tidbits that seem like clever jokes are actually facts!) You can download free 'lead sheets' (chords progressions and notated melody lines, with lyrics where applicable) for many, many songs by Bley and Swallow (and a handful by Karen Mantler). Included among these are "Can't Get My Motor to Start", "Hot River", "Boo to You Too", "Wervin'", and "I'm a Mineralist" from Fictitious Sports. You can also purchase big band scores and Bley songbooks. As Karen Mantler told me, "When we came up with this idea we never realized how many orders we would get for Carla's arrangements. It's been overwhelming, so please don't order one. One the other hand, lead sheets are free--so enjoy!" Michael Mantler's website is a little more organized, and just as chock full of information (including a brief page about Nick Mason). There are several full scores available for download, but no scores for the recordings in which Mason participated.